Victim Support in the UK has announced its new official ambassador, actress Brooke Kinsella MBE. The passionate anti knife crime campaigner will work with Victim Support over the next year to help promote our major campaigns and fundraising initiatives in the media and with partners. This week Brooke is calling on the public to help Victim Support meet growing demands on the national telephone helpline Supportline, which celebrates its 15th anniversary this week. Although crime has been going down overall for several years, more and more victims are reaching out for telephone and email support. So Brooke is asking the public to donate to help extend the Supportline service as well as urging Londoners to volunteer to take calls. 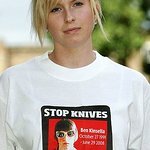 Actress and knife crime campaigner Brooke Kinsella said: "I am proud to be Victim Support’s Ambassador. “The charity’s Supportline is helping more and more victims deal with the impact of crime. But as demand outstrips funding there is a risk that desperate people may be left without support. Chief Executive of Victim Support Javed Khan said: "I’m delighted to welcome Brooke as Victim Support’s Ambassador. “When Brooke and her family tragically lost her brother Ben in an unprovoked knife attack, we supported them, so I know how much value she places on the help that is given for victims. Supportline volunteers are trained to talk to victims of crime anonymously and in confidence. Supportline gives emotional support and practical information over the phone and by email, and puts people in touch with Victim Support’s local offices, who can give more intensive and face-to-face support where it is needed. After Ben Kinsella was tragically murdered In June 2008, his family set up the Ben Kinsella Trust in his name. The Ben Kinsella Knife Crime Awareness Exhibition is aimed at children and young people from 9 to 18. The exhibition educates young people on making positive life choices, the laws and consequences of knife crime, staying safe and aims to stop young people from ever carrying a knife.